There is a saying in Nepali, “Dhunga khojda deuta vetiyo”, which literally translates to, when I went looking for stone, I found god. Although the meaning of this saying is deep and profound, we use it in our daily lives too. Something similar happened to me during this weekend, dhunga khojda deuta vetiyo. We went looking for a normal shop and we found a great place to eat :). A and I were out for shopping trying to find one particular shop in Bangkok. By the time we reached the place, we were already hungry but we had to go for dinner with friends in less than two hours. This meant we could grab something to snack before dinner. Then by the same building where this shop was, we saw a small outlet where few tourists were merrily eating. We went in to check what it was. It was a mexican food joint. I like Mexican food, but I hadn’t tried it many times to judge how it really was. I had been to few places that served Mexican food while in C city. 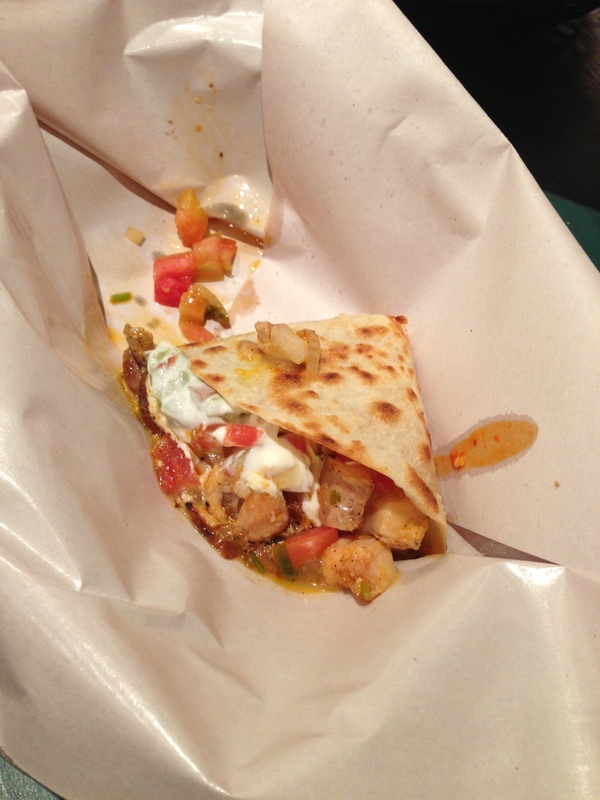 In Bangkok, we had been to Sunrise Tacos which is like a Mexican fast food chain and the food is okish, not too good and not too bad. But there was something special about this little place. The pictures in the menu looked yummy and there were more than one thing that we wanted to order, but since we had to go to this dinner in the evening, we decided to order some light starters and a drink. I ordered a snack size Quesadilla and A ordered corn chips with Guacamole dip and Mexican chicken wings. The Quesadilla was amazing. The chicken was grilled and juicy, it had red beans, cheese and capsicum filling. Each bite was juicy and succulent. 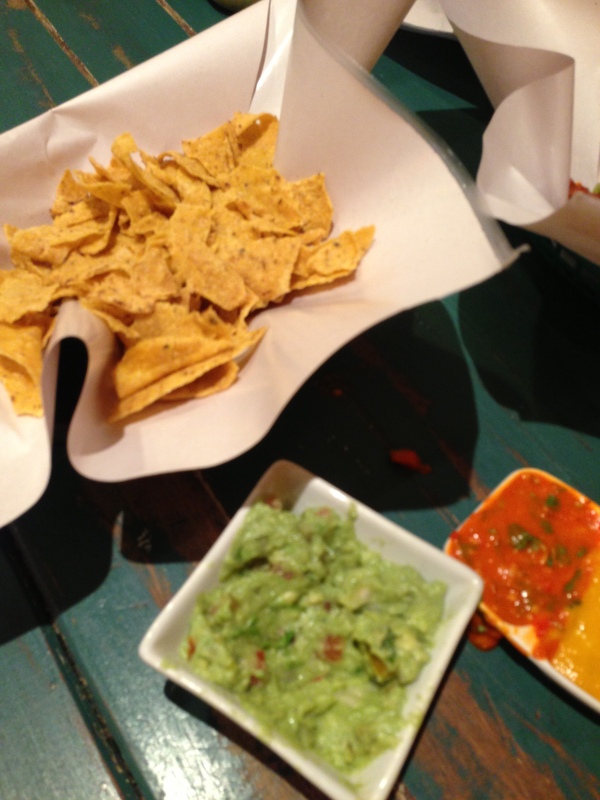 And next was Corn chips with Guacamole dip. Guacamole salsa is my favourite dip in the whole wide world, I often make it at home. But whenever we ordered this in some restaurants either the portion was very small or it was mixed with mayo, which we didn’t prefer. But this dip was perfect at this place. It was a bit different from what I usually make, this might be because I had never tried the traditional Guacamole before and I tend to put more lemon. Also the portion at this place was good, we got a bowl full of Guacamole and basket full of chips for 160Baht, which is not bad at all. 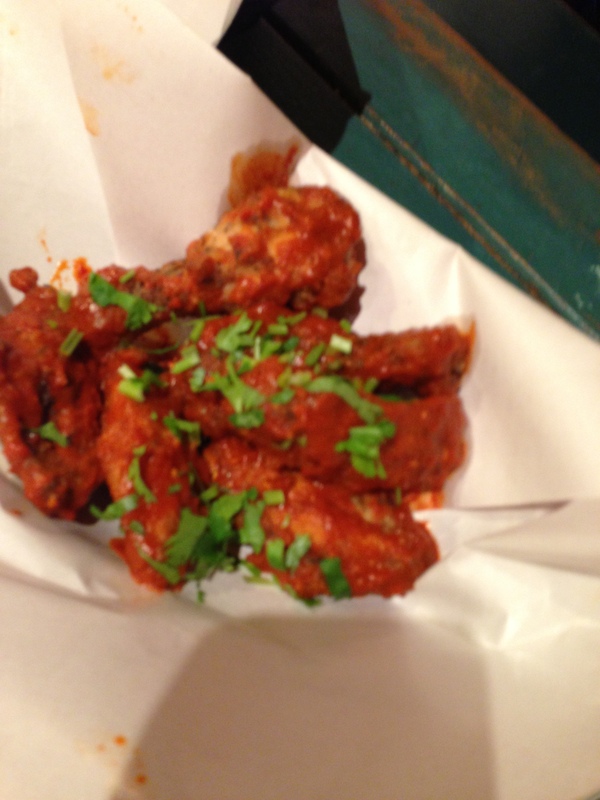 The chicken wings was also good, it had a nice tomato sauce and dried fish on top of it which made the taste unique (same as the newark golbheda ko achar/tomato sauce with dried fish). I had Mexican strawberry/kiwi soda to go with the food, which I expected to be as good as the Ranjana galli soda that we get in Kathmandu but it was not as good. Our overall experience at the restaurant was very good. We were pleasantly surprised, it also had a free salsa bar from where you could select salsa for of your choice to go with the food. The only thing that I didn’t like about the place were the bench. It was not comfortable at all. It had a hard wooden bench and table kind of setting which is not too uncomfortable given that the restaurant does not come cheap. On the day of Laxmi Puja, I made some Malpuwa to offer to Goddess Laxmi. Malpuwa is like a deep fried pancakes. I was never a big fan of Malpuwa before but this time it turned out really yummy. I didn’t do special shopping for making this, I just used whatever was available at home. So, I want to share my Malpuwa recipe with everyone here. First mix the flour and ghee and rub together. Warm 2 cups of water and add 1 cup of sugar until the sugar is completely dissolved. Pour the sugar syrup in the flour and ghee mix to make a pancake like batter with moderately thick consistency. If the syrup is not enough, put some more warm water in the mixture. Put the rest of the ingredients except the baking powder in the batter and mix well. 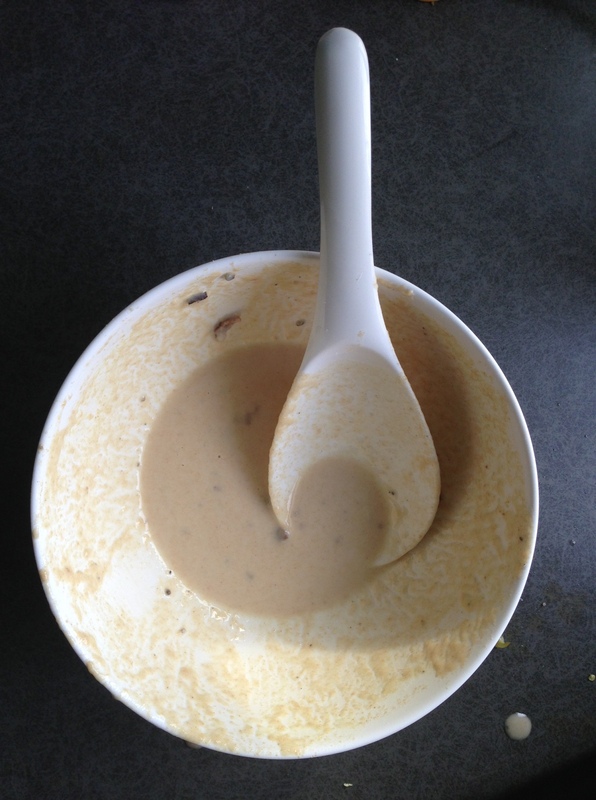 Malpuwa batter: I forgot the take a picture when the bowl was full. Now heat oil in a deep pan to deep fry the malpuwa. Mix the baking powder in the batter just before frying. Pour the batter mix with the help of a big kitchen spoon into the hot oil (I used the spoon that comes with rice cooker). 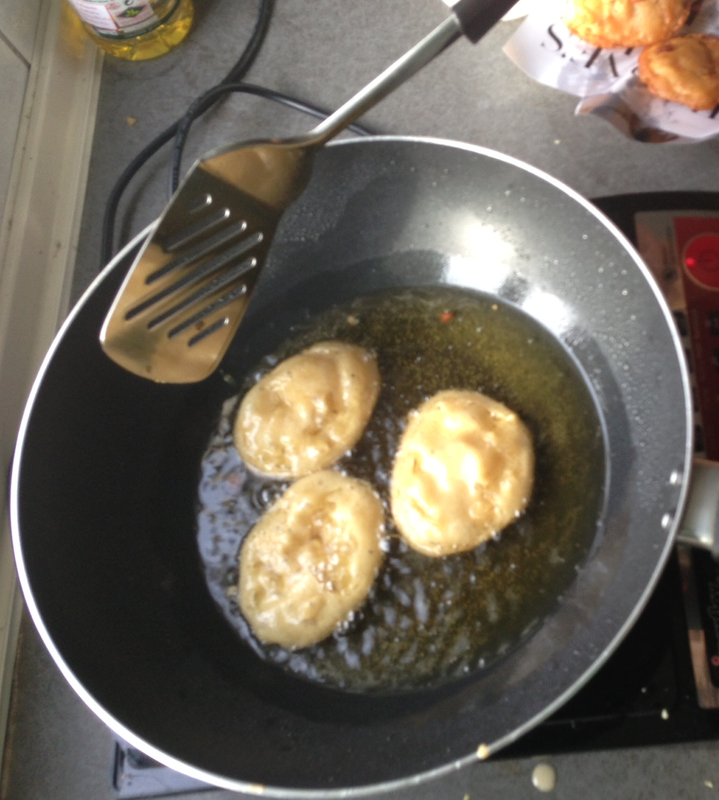 You can fry 2-3 malpuwa’s at one time but make sure that it is totally emerged in oil and does not stick together. 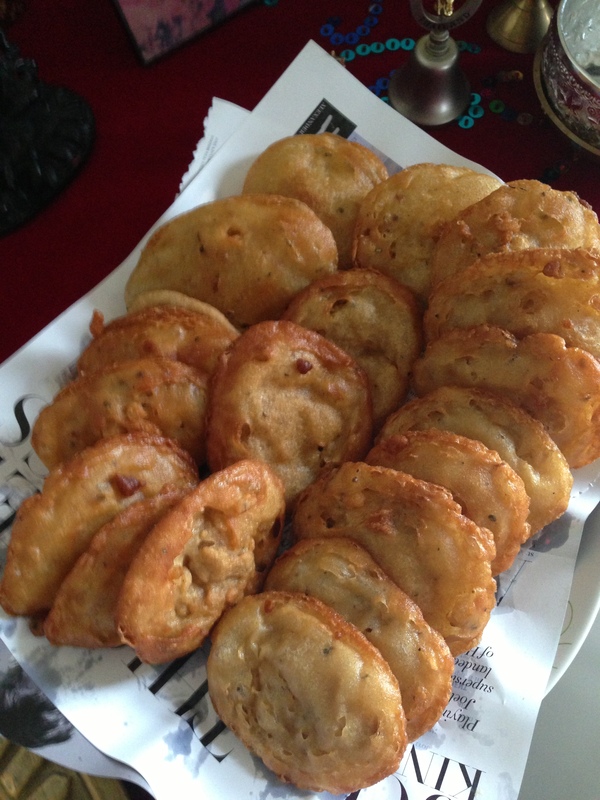 Fry until golden and crisp and your malpuwa is ready to serve :). You can also add fennel seeds, almonds and pistachios in the batter for more flavor. Also to make the malpuwa more crispy, you can add half a cup of Suji(or semolina) flour to the batter and adjust the batter consistency accordingly. Early this month, I decided to be vegetarian for every Tuesday of July and eat only fruits, vegetables and dairy on Tuesdays. This was to eat more veggies and avoid non-veg items once a week. Although I love the idea of being vegetarian everyday of my life, but eating meat is something that is very hard for me to give up. For us Nepalese, eating meat is some kind of reward and signifies festivities. In Nepal, we have 15 days of the month of October dedicated just for eating all kinds of meat and merry making. While in Nepal, we eat almost everyday at home. 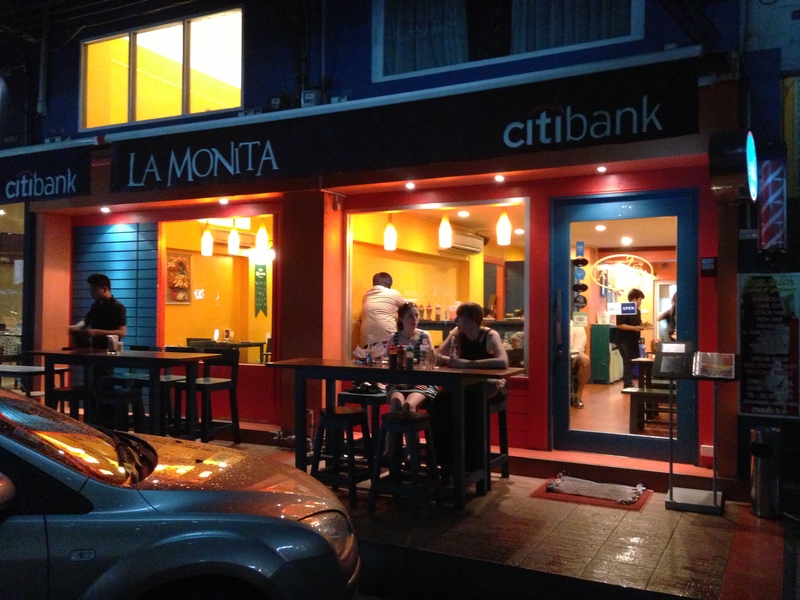 The concept of eating out is very new and mostly it is a luxury. Unlike in Thailand, most people eat outside and seldom cook due to easy availability of everyday food in reasonable prices. So, working in Thailand, my lunch is always at the office canteen. For dinner, some days I cook and other days we eat instant noodles or “Kao Mann Kai” or order pizza. I love food and I am very close to Nepali food. I enjoy trying out different cuisines as well. I have tried and loved Japanese, Korean, Italian, Thai, Indian, Vietnamese food to name a few. But, I cannot eat foreign food for 7 days a week. This is why I make it a point to cook 2-3 times a week. In Nepal, we usually eat vegetable curries with rice and lentil soup for lunch. 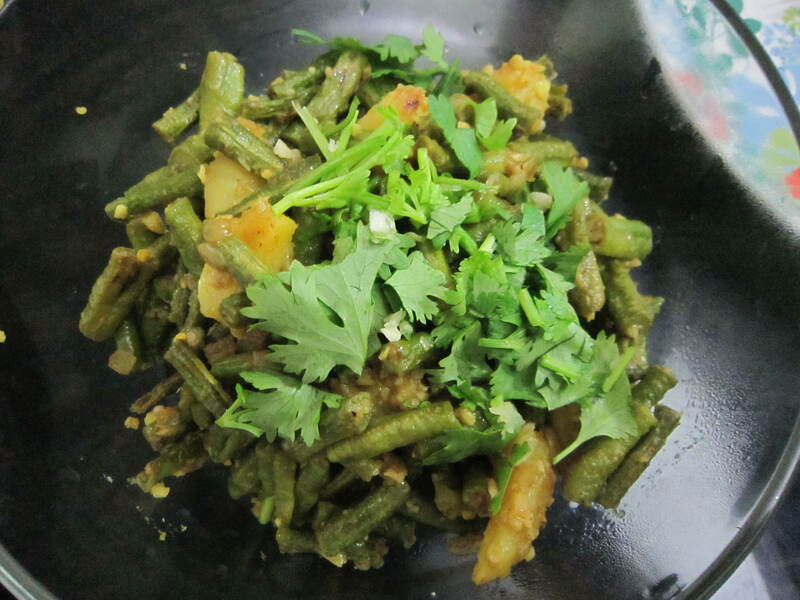 For dinner, we eat “Roti” (flat rolled whole wheat bread) with curried vegetables. Our everyday food does not have much meat but since my family is a big fan of eating meat, we have 3-4 days of non-veg meals in a week. 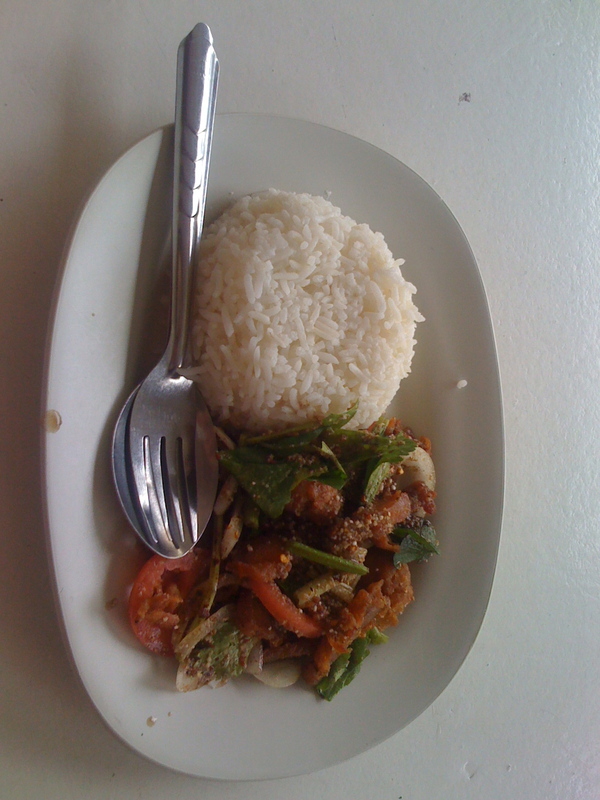 But, Thailand is different, here almost all the meals contains some kind of meat. So, whether its lunch or dinner or in betweens, there is meat. So, to avoid eating one or other kind of meat for every meal, I decided to have at least one day in a week dedicated to fruits and vegetables only. This post will be about my Tuesday experience. Yesterday was Tuesday, I started my day with a cup of plain yoghurt and an apple. A had warned me to eat good breakfast in advance so that I wouldn’t be bugging him with “I’m hungry A, I feel like eating fried Chicken” comments the whole day. The day was going fine and normal as usual. Specifically on my veggie day, I feel hungry a little earlier than usual. I don’t know if this is because of the psychological effect or its actually because of the vegetables and fruits only diet. So, I asked A to go for lunch at 11.30 am instead of going at noon. My options for lunch were fruits, fruits and fruits :). So I had already imagined the fruits I was going to eat for lunch, I love Guava and it is more tasty here in Thailand, the pineapples are juicy and sweet, papaya is sweeter than anywhere I’ve been and all the variety of exotic tropical fruits are just yummmm… as I walked towards the fruit stall, I noticed that it was more crowded than other days. As I reached there, I saw there was no Guava today :(, pineapple was not ripe 😦 and there was no papaya :(, but thankfully there was water melon, but water melon was not going to be enough for lunch. I bought a slice of water melon and some rose apples. Then A went to his new favorite food stall and ordered “Fried rice with crispy Chicken”, at this point I was so tempted by his order that I almost gave up my vegetarianism, but I reminded myself “R, there is something called self control!!”. So, I breathed in and breathed out reminding myself the fruits are way tastier and heather than normal fried rice with chicken, but in my mind I knew what I was going to eat for lunch tomorrow :P. So, as I munched my rose apples and water melons, A ate his fried rice savoring each spoonful of rice and chicken, which didn’t make me jealous at all and for God’s sake I was not drooling (if thats what you are imagining :P) it just made me wish for tomorrow to come sooner :). After A finished his lunch, I asked him to go to the store with me to buy some milk and organic brown rice crackers(its as good as veggies) and we went to the store and bought some flavored milk and crackers and to my delight, the lunch time was over. So, I started doing my daily chores at office but those snacks didn’t stop staring at me. It kept on distracting me. It felt as if it were holding a big imaginary board saying “EAT ME”. I totally ignored their desperate plea(or was it mine?) to eat them until 3pm when I couldn’t say no to them anymore and opened the bag of crackers :), it was yummier than usual. As the clock was nearing 5 pm, I was contemplating my dinner plans but the only option I had in mind was a plate of green salad with a cup of yoghurt as a dressing. I love to munch on green salad and I simply love yoghurt, I couldn’t help thinking why am I acting weird towards food, at that time I felt like a small kid looking forward to treats. Yesterday, I reached home at around 5.30, A had gone to play tennis and since it was my veggie day, he said he’ll eat out with friends. So, I was alone for the evening with my plate of salad and my cup of yoghurt. I had nothing but them for the evening so I wanted to plan my meal wisely. As I reached home, I took a long hot bath, after which I drank a lot of water. Then talked to my mom over Skype. Unlike other days, she was commenting that I don’t look like I have gained weight at all (the other day, I had mentioned that I gained 3 kgs). So she kept repeating, you don’t need to diet hai chori(daughter), you look good already. I was annoyed by her comments but I assured her I wasn’t dieting and I really was not dieting, I just wanted to eat fruits and veggies on Tuesdays!! After an hour long talk with her, I felt hungry and went to the kitchen to get my plate of salad, with yoghurt of course. As I finished my last meal for the day, I felt satisfied. It was only about 8 pm, I could not help thinking how women can fast for once or twice a week throughout their lives. I have seen my mom fasting on Fridays when I was little. I remember she went to temple in the morning, she looked more beautiful on her fasting days than usual, may be this is because of the red attire she puts on that day. But one thing we all knew that was never to nag her or annoy her during her fast! as she used to be a little more sensitive than usual (now she tells me it was because of hunger, she felt angry faster on the days she was fasting). Then I thought about fasting during “Teej”, how women do not drink even a glass of water the whole day. I would go crazy, if I were to do that. Yesterday, I thought of those women with more respect than usual. As I kept thinking about fasting and things related to it, I started feeling hungry :(. My meal quota was finished for the day but I still felt hungry, then my mom’s voice started echoing in my ears, “Chori, dieting nagara hai”(Daughter, do not diet), “Chori, dieting nagara hai….”, “Chori, dieting nagara hai……” :(. As I was surprising myself with unexplained, random and slightly crazy imaginations, A knocked on the door. As, he came in, my first question was “What did you eat for dinner?”. He ignored my query (sensing my restlessness) and replied, nothing special, we just went to the motorway and had something there. So, I didn’t ask him any further and told him I was hungry (my eyes were watering now). At this point he said, “Hare, bichara”(poor girl) and prepared a cup of instant vegetable soup for me. As as I drank it, he reminded me I wanted this vegetarian day for a good reason and I should continue it, however you don’t have to limit your intake to only 3 meals a day. You can eat as much of veggies and fruits as you want. He successfully convinced me and we watched a TV show as I drank my soup :). I went through a day filled with drama yesterday, hehe. It shows how impatient and restless I am, *sigh*. Anyway, I dedicate this post to all the women(and men), who fast. Especially to those women who fast during auspicious occasions for the betterment of their family and for the long and healthy life of their husband. They are truly amazing and I respect them more now :). This week, I am going to talk about Thai food. Everyday at lunch, we go to the office canteen and browse through around 13 stalls for Thai food, I think its great that I work in Thailand and I have so much options in terms of Thai food. Thai food is generally spicy and has rich aroma and flavors. Authentic Thai food is all about spices and aromas from herbs like lemon grass and lemon leaves. But there are milder version of Thai food that is more Chinese inspired which emphasizes on the actual flavor of the food itself rather than relying on other ingredients. Today I will talk about my lunch for Monday and discuss the ingredients. Yam Kai Krob with rice is one of my favorite dishes for lunch. “Yam” means sour but refers to hot and spicy and sour flavor(like in Tom Yam) in Thai, “Kai” is chicken and “Krob” is crispy. So “Yam Kai Krob” is Hot and Spicy and lemony crispy Chicken salad. As I walked to the stall where they sell Yam Kai, I said “Yam Kai Krob ka”, but they usually don’t understand what I say in Thai so the canteen guy asked me “araina?” meaning what? So at this point A stepped up front and said the same thing and the canteen guy nodded. A’s Thai is very good compared to all the expats here. After this, the big guy started tossing all the ingredients in a large bowl, mixed it and my salad was ready on the plate besides a scoop of rice (it took only about a minute). If you want to try this spicy Thai salad at home, you can refer to the following recipe that I guessed from my dish ;), but don’t worry its quite precise :). Tuesday is my vegetarian day, so wait for some more Thai salad recipe.